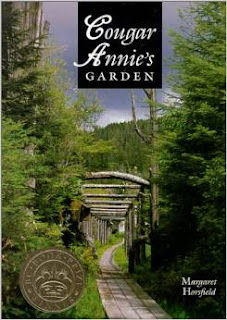 I want to thank my blogging friend over at Tramp's Camp for suggesting Cougar Annie’s Garden by Margaret Horsfield (Salal Books, 1999). 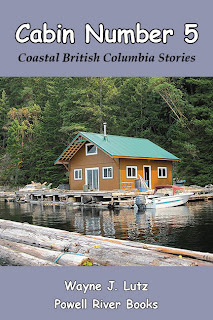 I’m always on the lookout for books about Coastal BC, and especially books about women who’ve chosen to live in remote areas. 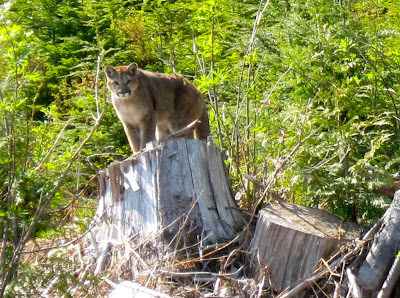 Cougar Annie was the colourful nickname for a fascinating woman who lived most of her adult life on the remote and at times inhospitable west coast of Vancouver Island. She was born Ada Annie Jordan in Sacramento, California, in 1888. That would make her of my grandma’s era. After experiencing exciting places such as English, Australia, and South Africa in her youth, the family settled in Vancouver, BC. Here she met and married Willie Rae-Arthur in 1909. Willie drank heavily and became addicted to opium. His doctor’s advice was to move away from temptation. Willie Rae-Arthur couldn’t have found a more remote spot away from the ills of city life than Boat Basin on the west coast of Vancouver Island. Willie pre-empted 117 acres that became his freehold property in 1915. By then, a cabin was built and Ada Annie had a good start on carving a garden out of the surrounding rainforest. Not an easy task. It wasn’t easy having babies and raising a large family in a boat access only location. Everything, goats and chickens included, had to arrive by steamer and then canoe. The book chronicles Annie’s life from 1915 through when she was blind and in her mid-90s. She married several times (mail order husband style) to keep the property going and made a living from nursery stock in her garden, running the Boat Basin Post Office (in the front of her house), and hunting and trapping (including cougars). Prior to her death in 1985, Ada Annie sold her property to Peter Buckland, a man from Seattle who befriended her and loved his summer trips to the west coast. He has since restored the garden and created an education center for field research and study. The encroaching forest has been kept at bay, and the legacy of an amazing, resourceful, sometimes ruthless woman has been preserved, at least for now. Here's some links with more information about Cougar Annie and her garden. Black Twinberry (Lonicera involucrata)is also known as Bearberry Honeysuckle and Twinberry Honeysuckle. It a deciduous shrub that grows up to 5 metres tall. Black Twinberry can be found throughout North America. In British Columbia it is most common in the southern two-thirds of the province. It prefers moist forests and thickets. The leaves have short stems, occur opposite to each other, and have pointed tips. Bell-shaped yellow flowers are in pairs. They develop into shiny black berries with bracts that turn red when the fruits mature. Up on Powell Lake the Dogwood trees are in bloom. Like everything this spring, they started a bit early. As the fisherman's saying goes, "When the dogwoods are in bloom, fishing is good." The Pacific Dogwood was adopted in 1956 as British Columbia's provincial flower. I think it's a great choice. The large white flowers really stand out when you get up close. The tin boat (follow this link for a ride on YouTube) is our favourite for fishing near our float cabin. Wayne uses a smaller lake downrigger and fishes at about 25'. I let out a long line and work the surface waters. Once we got into First Narrows, I got hung up on a snag. Spring quad rides let us see lots of green and blue. A phenomenon we've seen at the cabin quite frequently when it's raining is bubbles on the surface of the calm water in our natural swimming pool. The formation of bubbles on puddles is a common sight during heavy rain. Here we investigate the impact dynamics during bubble formation. High-speed video shows how the well-known Worthington crown closes above the crater to form the bubble. The closing bubble forms two jets one going up and the other down into the forming bubble, thus creating a toroidal cavity, which becomes unstable leaving a single bubble. That's a very scientific explanation for such a natural process. While all of these bubbles were forming on the calm water behind our cabin, there were absolutely none out front where the wind was rippling the water's surface. I wonder if that was part of his presentation. Here's a video of the bubbles in action. Here’s a book I found at one of my favourite used bookstores in Powell River, Kingfisher Used Books. The Inlet by Helen Piddington (Harbour Publishing, 2001) is subtitled Memoir of a Modern Pioneer. Helen was born in 1931, that almost makes her a contemporary of mine. 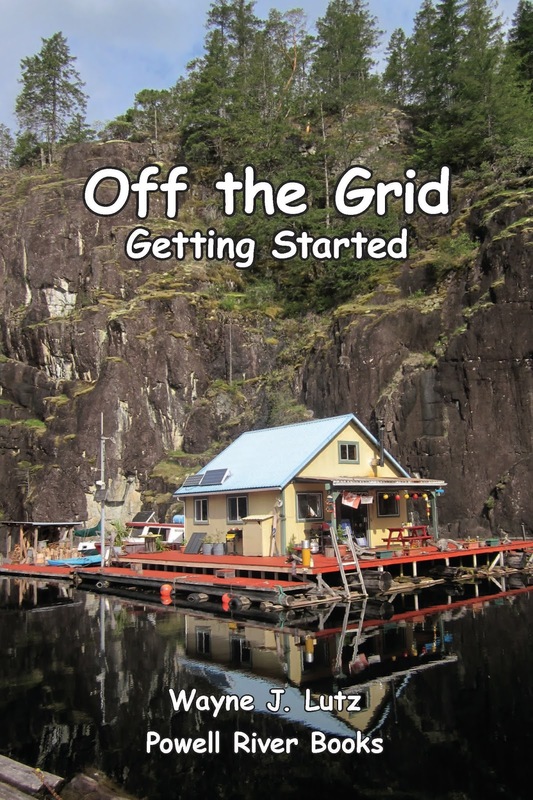 She’s an accomplished artist, and charcoal and pastel sketches became the basis of her book about remote log cabin life on a woodlot in Loughborough Inlet on Coastal BC’s mainland side of the Inside Passage. Helen met her husband Dane while coastal cruising to the Queen Charlottes (Haida Gwaii). Dane is a professional photographer and writer. They figured they could continue their artistic careers away from city life, but soon learned that living on the coast required much more. Dane became a logger, prawn fisherman, and woodlot owner. Helen became an avid gardener and all-around countrywoman, preserving much of their own food for winter. Such is the way of living an independent, self-sustaining life. Helen and Dave raised and home schooled their two children after their move north from Vancouver (for Helen) and Victoria (for Dave). When the kids reached their early teens, they went away to school in Campbell River and the prestigious Shawnigan Lake School north of Victoria. Each short chapter gives you insight into daily life, history, the residents and visitors, boating, weather, logging, animals, and the joys and challenges of living in Loughborough Inlet. I enjoyed reading this memoir of a woman with the courage to switch from big city living, to a rewarding but more difficult remote lifestyle. In 2010, Helen published a second memoir, Rumble Seat about growing up in the Victoria suburb of Esquimalt. To the best of my knowledge, Helen and Dane are still living in their remote home, and boaters continue to write about visiting them in Loughborough Inlet. 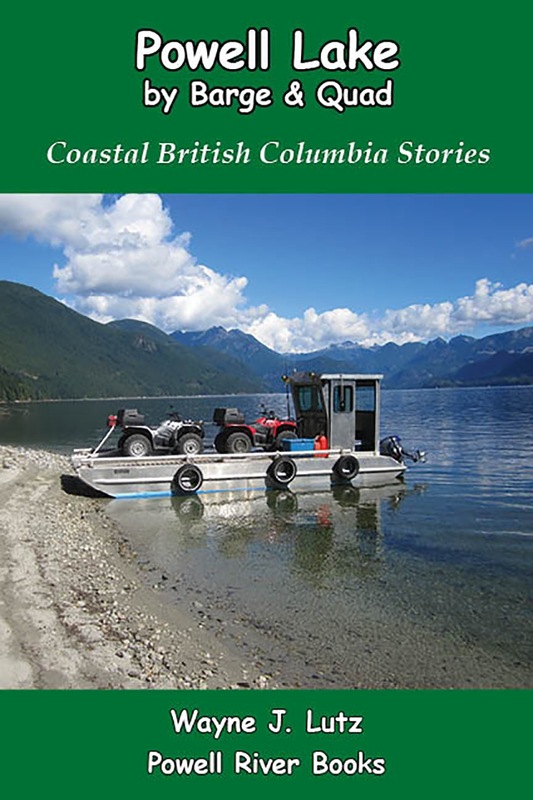 Do you know of any good books about Coastal BC, Canada, or remote living in general? I’d love to hear about your favourites. The skies here at our cabin just amaze me. I'm always finding something special. This week I saw the first solar halo of the season. A solar halo occurs when when the sky is covered by thin cirrus clouds containing ice crystals high (5–10 km, or 3–6 miles) in the upper troposphere. The sunlight is bent as it passes through the ice crystals. It may also split the light into colors, much like a rainbow. Mine was of the more sedate white variety. A 22 degree halo is the most common. The light from the sun passing through the ice crystals typically makes the inner edge of the circle more reddish and the outer edge more bluish. I saw this solar halo on May 10, 2015, looking south from my cabin in Hole in the Wall on Powell Lake in Coastal British Columbia. If it had been any bigger it would have been too large to capture the entire image in my camera's field. Standing on the bridge at the head of Powell Lake. 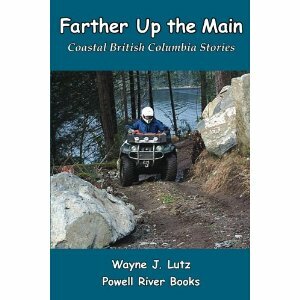 My husband Wayne and I discovered Powell River while on a summer holiday in 2000. On a return trip in 2001 we discovered Powell Lake and its unique float cabins. The one we purchased that year has become our home in all seasons. Come along with us on a trip up the lake and see why it continues to excite and inspire us every day. Water from rivers and glaciers in the Coastal Range flows through Powell Lake down to the short (only 500 metre) Powell River near the town that bears its name and into the Strait of Georgia. Many Powell Riverites know all about going "up the lake," but if you’re new to town or planning a visit in the future, here’s a sneak preview. To read the rest of the story and see all ten pictures, head on over to the Powtown Post by clicking here. Thanks Jordan for inviting me to write a guest post. It's an honour to be included on a website that's "dedicated to bringing you the best, most sharable stories from Powell River, BC." 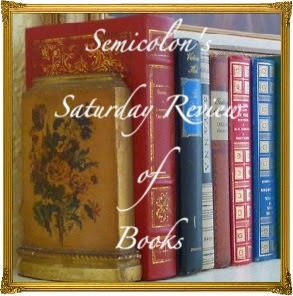 Readers, I encourage you to hop on over and check them out. Bert and His Lovely Lady on the clothes line. I keep a logs of first arrivals from year to year. That way I know Barn Swallows are very punctual. Going back in my records to 2008, they've always arrived at our float cabin home during the first week of May. This year was no exception. On Sunday, May 3, a pair circled out front and landed on the clothes line on our side porch. I'm quite sure it's the same pair from last year. It's an obscure spot, yet them homed right in on it. Last year we tried to encourage them to nest away from our side porch, but this year we changed our minds. Once we saw they wanted the same spot again, we readied the facilities. Plastic for protection under the nest site. First, I put up plastic to control droppings and make cleanup easier. Wayne made them a more secure nesting building spot than on top of the clothes line knot. Last year I worried every time the wind blew because the line would sway and rock the nest. In fact, during the winter it blew down. Wayne put up a shelf in the nest site. While the pair was away, we got an L-shaped bracket we'd saved and nailed it up next to the clothes line. This will give the new nest a better support structure. We through something different might scare the pair away, but no worries. As soon as they returned, Mrs. Barn Swallow (we call her Bert's Lovely Lady) sat on the ledge, and Mr. Barn Swallow (Bert of course) sat next to her on the clothes line. There they stayed all night until early morning flying bugs lured them out for a hearty breakfast. I look forward to watching the birds right from my living room sofa. And picture taking should be a breeze. 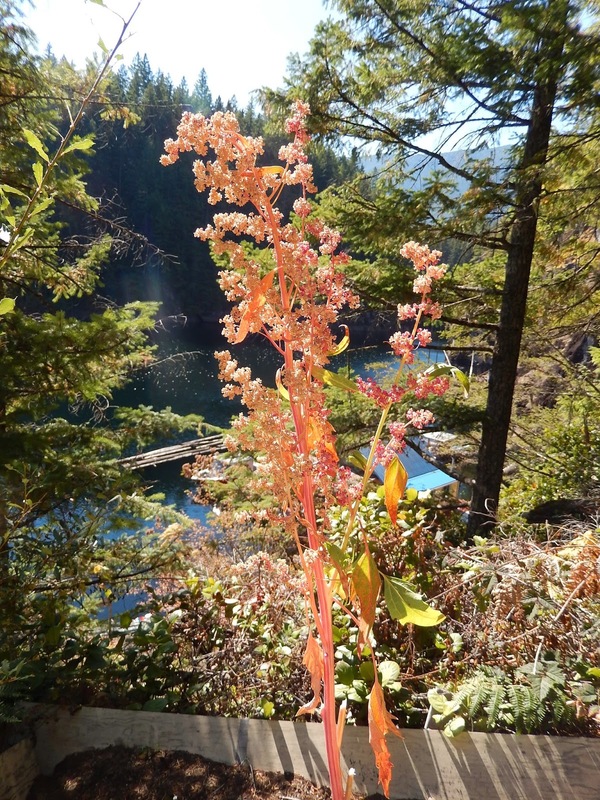 Last year I experimented with growing quinoa for the first time at our float cabin up Powell Lake. It's an ancient grain with recent popularity because it's high in protein and gluten-free. I've eaten it, and like the nutty flavour. So, I figured it was worth giving it a try. After some research online, I found locally produced seeds at Salt Spring Seeds. I figured, if it grows on nearby Salt Spring Island, it might grow up Powell Lake. Quinoa grows in all kinds of soil, but prefers well composted and well drained conditions. The plants grow from four to six feet in height and prefer full sun. I planted my seeds directly in the soil in April. Spring rains kept them watered through June. After that, I hand watered every week or two. Quinoa is a slow starting plant. In addition to the seeds being edible, the leaves make good additions to salads and cooked, much like spinach. Thinnings can be used in this manner rather than relegating them to the compost pile. Or you can pick young leaves as the plant grows. Quinoa is a very low maintenance, drought resistant plant. Keeping weeds away allows them to grow larger. My problem was keeping the hungry land critters away. They enjoyed the tender leaves and stems so much, I ended up with only one plant reaching maturity. Once the seeds were dry, I used my fingers to rub the seeds from the stems. I kept removing bits of stem and seed cover remnants until all that remained were the quinoa seeds themselves. Then I stored them in a glass canning jar with a tight lid. We've been having on and off clouds and showers these past few weeks. That makes for some really spectacular sunsets here in Powell River, BC. Last week I looked across the Strait of Georgia to see this unusual sun dog.